Click and read the entire article from AIR CARGO NEWS ! Speaking at the Air Cargo China event in Shanghai, chief executive of the general sales and service agent (GSSA) Adrien Thominet said that the company hoped to be able to announce an acquisition in Asia by the end of the year. He explained that the region’s GSSA market was still very fragmented with lots of ‘local hero’ companies and there was a need for market consolidation. Potential low-cost carrier customers, which often look to completely outsource their cargo operations, are also in abundance in the region, making it a good area for investment. In conjunction with its expansion in Asia, the company will also continue to invest in its IT offering, something that low-cost carriers are asking for as they are increasingly asking for more business intelligence information and visibility of their cargo revenues. He said: “There are a lot of low-cost carriers in Asia and they all want big GSSA that have a network, can give them financial guarantees and an IT platform. Customers using ECS Group companies will benefit from an expanded network if the GSSA adds to its network in the region through acquisitions, Thominet said. In 2016, ECS purchased Bangkok-headquartered AVS, which specialised in the Southeast Asia region. On the customer front in Asia, in 2016 ECS won a major deal to provide Singapore’s Jetstar Asia with GSSA services across its network in the region. More recently, the company won a contract to provide Royal Brunei with GSSA services in north east Asia, Southeast Asia and Europe as the airline divided cargo operations up into five separate regions. 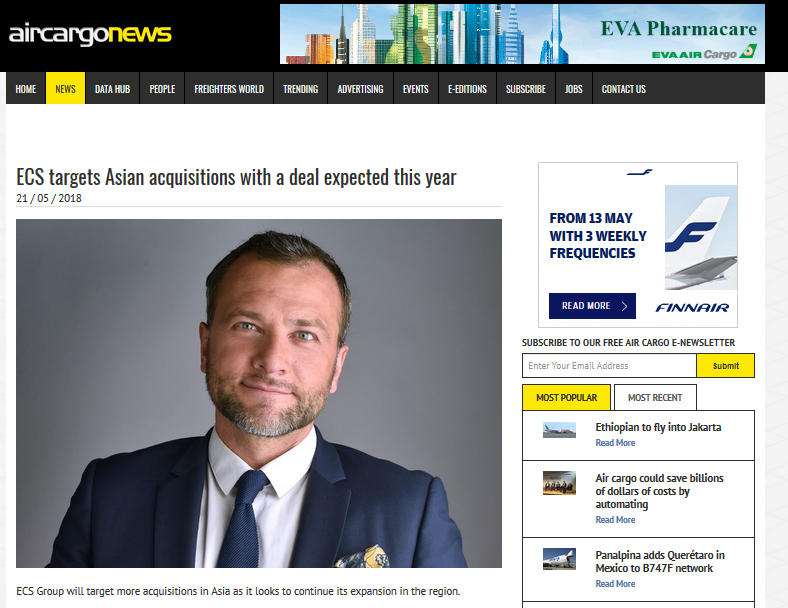 “The big ambition is to grow massively in Asia so this kind of big contract is an additional footprint and also means that we are delivering the necessary organisation and services in the region,” he said. Thominet added that the company would also look to expand in South America and North America, although there are no definite targets on the table at the moment. In Europe, he said ECS had two or three companies in most countries and the market was largely consolidated already. The company is also actively trying to recruit young people as it continues to enhance its digital portfolio of services. Said Thominet: “My big ambition is to bring the younger generation into this group. Not that we are old, but I am amazed by the millennium generation. When you tell them digital, they say yes of course. They don’t even know how you can do it without digital so if you tell them they will learn to make e-bookings, for them it is natural.